I don’t know about you, but this year’s Grand Forks winter has me longing for summer. I know it is around the corner somewhere, but I’m willing to do anything to bring it just a little bit closer. So today I thought I’d share some of my ideas for lighting your patio. Then, hopefully you’ll have plenty of time to plan, shop, and/or craft to prep your patio for summer bonfires, happy hours, grill-outs, lounging – or whatever entertaining and R&R you’ve got planned for the warm evenings ahead. With outdoor lighting, you can really get creative in how you light your space. As with indoor lighting, outdoor lighting should be planned around your activities. Secondly, you’ll want to consider how easy you want it to be to turn lighting on and off. Some of the DIY and temporary lighting options I have below require more effort than the permanent options, which are as easy as flipping a switch. Let’s jump right in and I’ll explain more as we go. Pinterest is full of do-it-yourself outdoor lighting ideas. If you consider yourself a crafter, you can simply take your pick. In my opinion, these options offer a few perks. The first is that many of these crafts incorporate recycled material, so they are earth-friendly. Secondly, they’re also budget-friendly; your time and energy, plus materials, are the only expenses you’ll have with these DIY options. 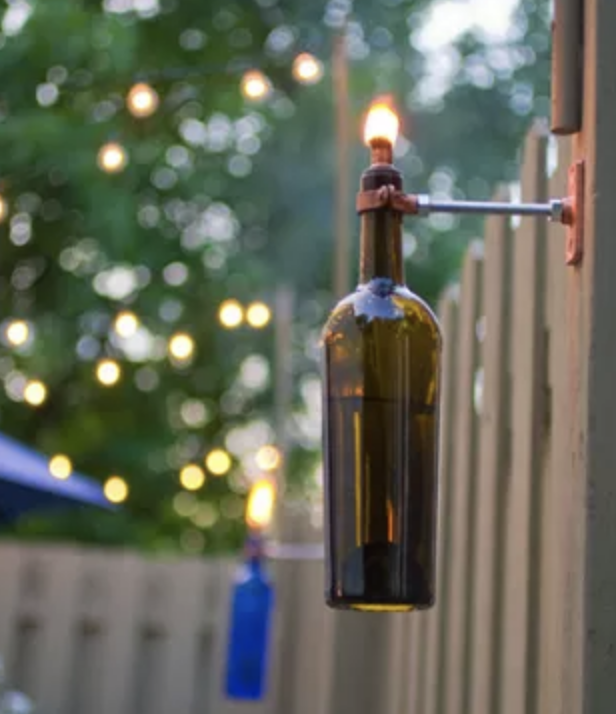 The one challenge with most DIY options is that they often need to be lit or turned on individually, so there is additional time required when setting up your outdoor space each evening. Mason jars have become the go-to craft material for home and wedding decor – so why not extend that into your outdoor patio? You can make table-top or hanging lights, and I’ve seen candles as well as string lights used as the light source inside the jars. Once you’ve decided on a light source, let your imagination run wild with how you embellish the jars – string, burlap, beads, sand, shells, coffee beans… the list is endless. Remember that your light source will generate some heat, so choose your embellishments with this in mind. Safety first! In addition to being decorative, you can create a patio lighting solution that is functional as well. Tiki torches fend off mosquitoes, and they can look great doing it! These torches can create a decent size flame, so you’ll want to place these light sources carefully. Patio string lights are very common at outdoor weddings and popular restaurant patios. They work well on residential patios, too. When strung well, they provide a nice, even lighting and create an enjoyable, relaxed atmosphere. I am classifying this option as a temporary solution, because if you, like me, live in a place where you get to enjoy all four-seasons, you’ll want to take these lights down during cold winters, or heavy winds to prevent damage. My second, temporary outdoor lighting example serves the same purpose as the DIY mason jars, though require no crafting effort on your part. You can choose lanterns that match the theme of your space, add a candle and you will be set to go. I would also recommend moving these inside during harsh weather to protect them from damage. This lighting is often secured to your house (or a building on your property) and wired to a switch. This is the easiest to maintain, though the most costly as you set it up. Outdoor lighting comes in all shapes and sizes – wall sconces, posts, landscape and security lights. In addition to adding light to your outdoor space, permanent fixtures can also add value to your home. Check out this blog for more outdoor lighting tips. The style and function outdoor light fixtures offer can be enjoyed throughout the seasons and for years to come. I hope prepping your patio distracts you from the cold and has you blissfully looking forward to summer, and all the fun and relaxation that will happen outdoors.